Whether you are a photographer or a Photoshop User, you probably stumbled across a color management problem. Have you ever looked at a photo on your camera’s LCD and then noticed it looked very different on your desktop monitor or laptop? And, then when you tried to print it, it did not match any display? The problem is monitors, laptops, scanners, printers, cameras and even software programs all handle colors differently. Color management tries to reconcile this to produce consistent results. 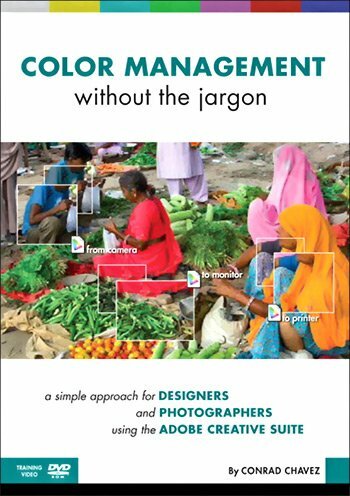 Color Management without the Jargon by Conrad Chavez is a new video/DVD from Peachpit Press. Chavez is the author of Real World Photoshop CS4 for Photographers and he explains this complex situation in layman’s terms. Basically, all documents that contain colors can include a “profile” which explains the range of colors (or color space) and how those colors should be displayed, interpretted or printed. Profiles can be embedded in digital photos, vector images, and even PDFs. Hardware (monitors, laptops, scanners and printers) can also have profiles. When a program like Photoshop opens such a photo with an embedded profile, it will read the profile and display the colors accordingly on a monitor with its own profile. All of these profiles are attempting to standardize the handling of these colors so they are consistent across all devices. 1. For the incoming image – where did this image come from? 2. For the image you are editing – why is the image being edited here? 3. For an image being printed/exported – where is the image going? By working through these questions, you can properly assign, convert or embed a profile to achieve consistent results — the goal of color management. Chavez does a wonderful job at explaining this complex concept, and how you can properly use profiles. Chavez achieves what he sets out to do — teach color management without getting bogged down in all the jargon. Next → Next post: Adobe Camera Raw 5.6 Official Release is a Noisy Mess for Canon 7D Raw Files!